A while ago I posted about Drying Hydrangeas here. I dried a lot of them this fall, awaiting project ideas worthy of them. I saw this idea on Thrift My House and loved it! She shares a bunch of beautiful ideas for empty ornaments. Isn't the internet fantastic for sharing cool ideas? 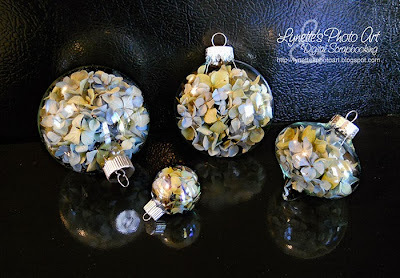 I also made the Cotton Boll Ornaments I saw there. They are the post before this one, so scroll back if you are interested. I bought some empty glass ornaments at half price for $3. It wasn't as easy as you'd think getting the fragile blossoms into the ornaments as you'd think. They just didn't want to go and it was tricky separating individual blossoms from the clusters. I ended up using these really long tweezers my father had owned. They are the weird kind that you pinch to open. I was able to hold each stem close to the blossom and twist to separate it from the cluster and then with it still held, push it into the ornament. Not one broke! Man it took tons of blossoms to fill this larger ornament! Not so many for the tiny one...OF COURSE! 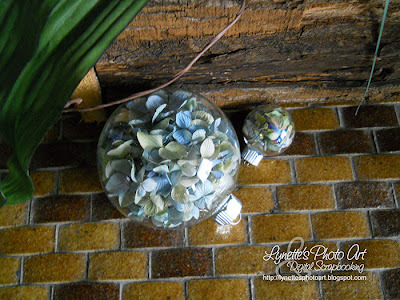 One thing I love about putting the blossoms in these glass ornaments is that I was able to use clusters I dried, but they weren't good enough to use as a whole cluster. After all the time and effort to dry them, some of the individual blossoms didn't dry just right. There were still lovely flowers on the cluster, but the cluster as a whole couldn't be used. For these ornaments I could use just the lovely blossoms, and also alternate the colors as I filled the ornaments, placing them where I wanted them so they'd look their best. I experimented adding a little bit of delicate glitter to the ball, but it just static stuck to the sides and collected in the bottom. :( Happily, all it took was a few taps with it upside down to remove it all. Yeah! Just a fun note...this picture is curtsey of The Accidental Remodel of our kitchen! I can now put things on my upscaled microwave cart and use the black refrigerator it's up against as the background for pictures! :) Serendipity! I love the reflections! That's thanks to the industrial gloss enamel spray paint I keep telling you is a marvel, having used it to upscale my old hardware, the microwave top and the hardware my ceiling light hangs from. Check it out! Thanks for dropping by and be sure to check out her other ideas with the link above!